The Charleston Gazette - October 31, 1968. 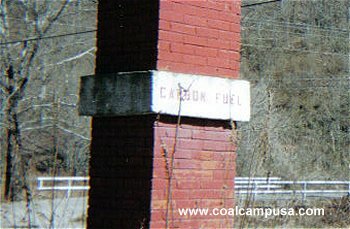 Carbon Fuel Co. does issue scrip to employes in lieu of a cash advance, a company spokesman said Wednesday, but it "deplores those outside the company" who buy scrip at a discount. "Scrip" is an economic anachronism that was popular with coal and steel industries in the early part of the century. Only a handful of firms use it today. The metal tokens, which supposedly are redeemable only in merchandise or cash within the company, enjoy a booming traffic in the upper reaches of Cabin Creek. Lester T. White, manager of Carbon Fuel's Winifrede No. 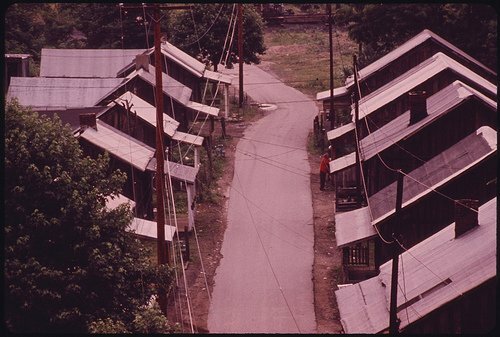 2 store near Decota, was ired by a recent article by New York Times writer Joseph A. Loftus, who wrote: "In Carbon the coal compnay still pays in scrip, good at the window-barred company store, and agrees to advances on wages at reported rates of interest that exceed a sense of the credible." White said the statement is untrue. "Scrip is used only as a means of credit. The employees are paid in cash on paydays." 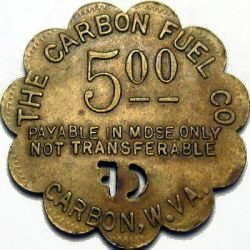 A Carbon Fuel worker must have already earned wages before he can obtain scrip in advance of his payday, White explained, and then it is only redeemable at the store for merchandise ... Beer joints strung along the hollow are accused of demanding whopping interest charges in the exchange for scrip. "Some of these places will give you a dollar for a dollar," said James K. Moore, an employee of Carbon Fuel's No. 20 mine. "But if they don't know you, they give you, maybe, 70 or 80 cents cash." From a September 1985 A.P. 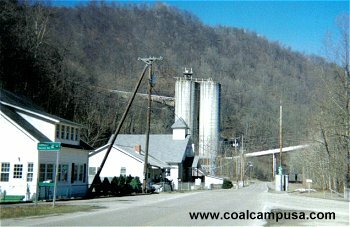 article titled "Cabin Creekers Now Mine Junk Instead of Coal" by Strat Douthat: KAYFORD, W.Va. - At the Bethlehem Steel bathhouse, where just a couple of years ago hundreds of miners washed the underground grime from their bodies each day, rats and lizards scamper across the floor. Flies buzz through the shot-out windows and vines choke the gaping doorway. 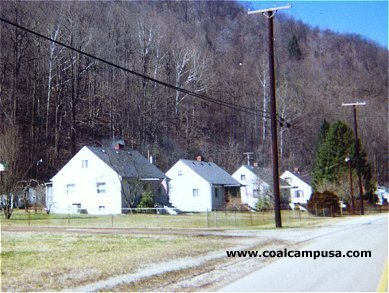 Once a proud prototype of the Appalachian coal industry, this Cabin Creek valley town southeast of Charleston is now a place where desperate, dispirited men spend their days drinking beer and scavaging the abandoned mines that used to employ them. One recent hot summer afternoon, several men sat outside the Bethlehem complex in the parking lot, downing six-packs and discussing how their world had collapsed. 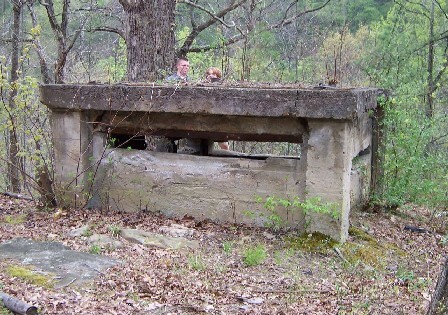 They also talked about what piece of abandoned, rusting mine equipment to attack next with their acetylene torches. One, a middle-aged man with a gray stubble of beard, shruggled philosophically as he discussed the pastime of Cabin Creekers called "junking." "We don't figure they're ever going to be using it again, anyway," he said. "A fellow can make $300 to $400 a week junking if he's got a truck to haul the stuff away." 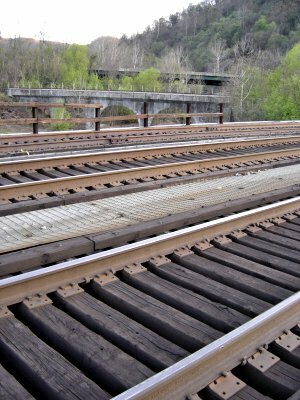 Hundreds of loaded railroad cars used to rumble down the valley each day, carrying out coal and pumping in money to the communities built around each mine. Now, as one life-long Cabin Creek resident says, "It's the people that are pouring out of this hollow." Pearl Harrison, postmaster at Leewood, three-quarters up the creek, said she had seen a steady exodus in recent months. "Kayford's just a ghost town now," she said. "Lots of young families have left from around here." 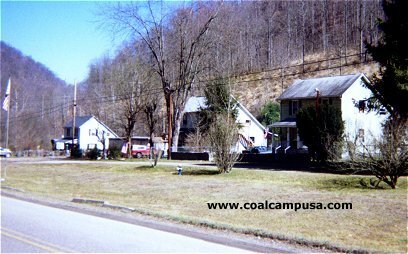 Thirty years ago 10,000 miners worked along Cabin Creek. 10 years ago the figure had dropped to 5,000, and two years ago it was down to 2,500. 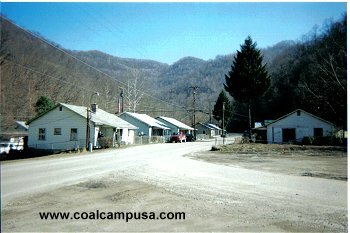 Now, only one small deep mine is operating along the 20-mile long hollow, employsing about 25 miners. The man with the stubble, who said he preferred not to be identified, is a former mine electrician whose services once were in great demand. Now, as he sees it, he's too old to start over, too young to draw a pension, and just right for junking. "This is all I have to do since they cut me loose" two years ago, he said. "It used to be I couldn't be out of work for two days unless they were calling me. And now there's nobody left to work for here." 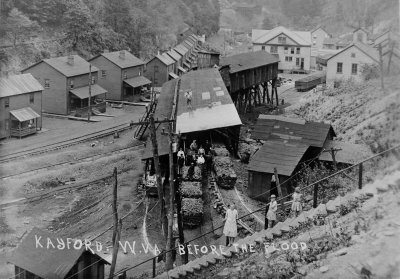 Quin Morton III, whose father and grandfather helped develop mining along the creek [And who tried to murder the miners on neighboring Paint Creek from the Bull Moose Special train - author), well remembers when 10,000 miners labored deep beneath the steep hills. 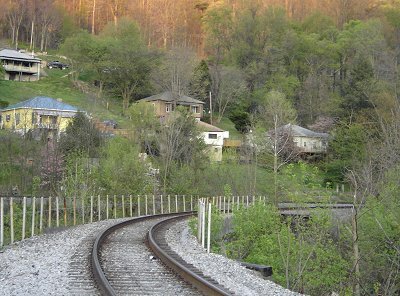 Morton, retired president of the now-defunct Kanawha Valley Coal Operators Association, said plenty of coal remains along the creek and that the mines will be productive again - someday. His optimistic view is not shared by many Cabin Creek residents. 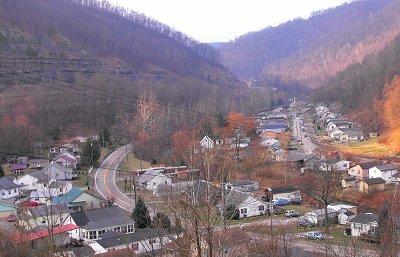 "Buddy, things will never be the same around here, not like they once were," said David Pullen, who has spent all of his 60 years at Giles, just below Ohley, the onetime home of former United Mine Workers president Arnold Miller. Pullen, who operateds a service station, said Cabin Creek was dead. "Buddy, I can remember when they pulled 550 to 600 coal cars out of this hollow each day," he said. "now they haul about 50 cars out a couple of times a week, and it's the people that are pouring out of this hollow. William Carroll of Ohley nodded as Pullman talked. 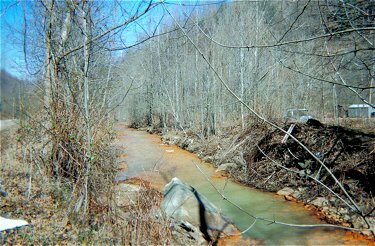 "I've lived on Cabin Creek since 1938 and I've never seen things this bad," the 69-year old retired miner said. 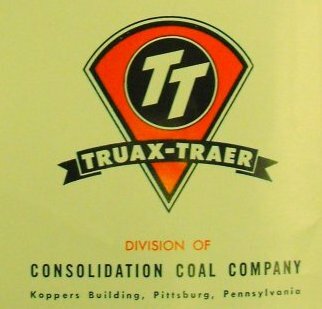 "Used to be the coal trucks and the coal trains ran 24 hours a day. Now it's real quiet." The men stood in front of a gas station-grocery operated by Pullen and his wife, sho said at least half of her grocery customers paid with food stamps. "That's what is keeping us going right now, food stamps and pension checks," Pullen said. "The older folks help out the young'uns. The boys bum enough money for a couple of beers, and the old folks sit on the porch." One young man who doesn't bum beer money is 23-year-old Bruce Stanley of Eskdale. A former miner, he now works for a rental car company. "I was laid off about a year before I found a job," he said. "But I made more in two days in the mines than I make in a week now. I started at the top and I'm working my way down." As he spoke, a teen-ager strolled past. "Kids like him will never know what it was like to make $500 a week," Stanley said. "I got in the tail-end of it, but it's gone now. Even junking is not as good as it was a couple of years ago."